The club was founded in 1954 at a time when there were 2 factions in British cycle racing – the National Cycling Union (time trials) and the British League of Racing Cyclists (road racing). John Backwell, Phil Steadman and Brian Dodd were captivated by the glamour of continental road racing and naturally sided with the BLRC when forming the Velo Club Bristol. During the late 1950’s, a rewarding relationship developed with the Bath Olympic club resulting in Bill Rains becoming the VCB’s 1st President. Bill was instrumental in the development of the British Cycling Federation and became a respected and influential part of British cycling, leading the way in the setting up of professional racing in the late 60’s.This relationship between the 2 clubs developed with mutual support being provided to VCB riders and events and VCB members helping the Bath Olympic’s promotions, including the prestigious Tour of the West and the Weston Super Mare GP. The 60’s and 70’s was a great time for cycling road racing in the Bristol area and the VCB made a significant contribution to this success with both riders and promotions. 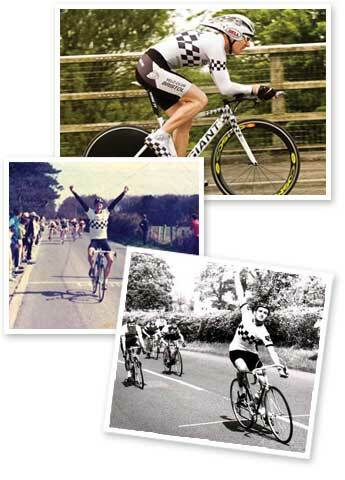 There were many competitive road-racing successes with riders gaining 4 Division Championships (Richard James, John Turner and Dari Kasprowicz (Senior) and Tony Robson (Junior). During this period the Club was often fielding 3 teams of riders in different races around the country, giving all the club’s members an opportunity to ride in top class races. The Club recognized that to be a successful ‘road man’ riders needed to be able to produce a good time trial. Dave Doust proved to be a superb time trialist, becoming National Junior 25 mile time trial champion in 1967. Dave went on to become a member of the national track team pursuit squad in the late 60’s. In this period, 2 of the club’s riders turned professional, firstly Steve Taylor and then Dari Kasprowicz. Steve became a successful and well-respected rider in the professional peleton but it was a sad loss when Dari died, before he realised his full potential in the professional ranks. During this period, John Backwell led the club as Chairman, encouraging others to promote events with the VCB becoming one of the leading clubs in the Western Division. Riders would travel from far and wide to compete in VCB events, knowing that they would be organised to a high standard, on challenging courses and with good prizes. The club was instrumental (as a result of Steve Taylor’s efforts) in persuading the Bristol City Council to create a purpose built circuit at Hengrove Park. The park had been used for many years (using the old airfield runways) but new housing developments threatened the end of this facility. Steve worked tirelessly in getting this circuit up and running, particularly important as it provided a safe ‘entry’ to racing for young people. This was a tremendous achievement as it was the first purpose built circuit in the UK, some 2 years ahead of the Eastway circuit in London. The club organised races at the new circuit and continued to promote events on the road. Again Steve Taylor was instrumental in promoting events on the Portway (when it was shut due to major road works) and around the roads of Cannons Marsh, this being the first time roads had been closed in Bristol for cycle racing. This event proved to be the forerunner of the club’s most prestigious promotion (again due to the untiring efforts of Steve Taylor and others), the Bristol Grand Prix, sponsored by the Royal Mail. This drew a top class field from around the country for many years and was part of the ‘Star Trophy’ series in the 80’s (a prelude to the current Premier Calendar) with the club’s Andy Massey winning the event. On the same day as the GP, the club ran events around the closed roads of Bristol City Centre, drawing on a fantastic support base of approximately 100 people to organise and marshal the 2 events. Bill Rains had proved to be a fantastic President and his passing was of great sadness to the Club. It was fortunate for the club that Dave Foxwell (another member of the Bath Olympic and latterly organiser of the Tour of the West) agreed to take on the mantle of president which he has done superbly to this day, helping at club promotions and providing support and guidance. Racing Continued through the 80’s and 90’s with Gary Cooper and Dave Park leading the senior riders and top juniors Simon Jones and David Rutty all riding and winning for the club. Simon went on to become the head coach with British Cycling and David continued through to the senior ranks becoming Divisional Champion, UK National Student RR Champion and an Elite rider. After 40 years as Chairman, John Backwell stepped down in 2004 in favour of Ken Dicker. There have been several changes in Chairman since then, with David Rutty currently leading the club in this role. Cycling, and particularly racing has changed dramatically in the last two decades, general interest in cycling is growing all the time and Velo Club are here to capture that energy and spirt. Continuing to evolve and move with the times. The 75th Anniversary in 2029 is to be looked forward to!